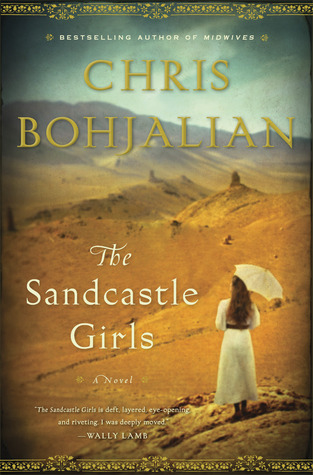 The Augusta Library Book Club met on Feb. 12 to discuss The Sandcastle Girls by Chris Bohjalian. Despite the breezy-sounding title, this was a story of love, death, and family history that shifts between modern times and the early 20th century Armenian genocide. While the book couldn't really be described as "enjoyable" (its descriptions of horrible suffering on a massive scale were hardly fun to read), most Book Club members seemed to find it important and thought-provoking. The meeting began with a long discussion about the the history and geography of the regions described in the book, complete with maps courtesy of Duke. Some members then questioned the author's use of a female narrator and time shifts, pointing out that they made the book a bit confusing. After a brief debate, however, the general consensus seemed to be that these devices captured the narrator's personal growth and deepening understanding of her family's history. Several members found parallels between the narrator's grandparents' reluctance to talk about their ordeals and the reticence of real war survivors. They also found interesting comparisons and contrasts between the foreign aid depicted in the book and modern aid efforts. Some pointed out that instead of simply shipping large loads of supplies to an afflicted area, as the Friends of Armenia did in the book, many modern charities focus on helping people become self-sufficient. Members did take time to discuss the plot and characters, though, especially since they wanted to end on a topic much less depressing than the ones that had been covered earlier in the meeting. They discussed the motivations of Elizabeth (one of the protagonists), and many were pleased with the love story and Hatoun's implied survival despite the odds against her. They also appreciated the narrator's deepened understanding of her family's history. While these more optimistic topics lightened the mood for the meeting's end, Kathy's caramel corn cookies finished the mood-lightening process quite effectively. All told, the Book Club's February meeting was an educational (and ultimately nourishing) gathering. The Book Club's next meeting will be at the library on Wednesday, March 12, at 6:30 p.m. The group will be discussing The Dog Stars by Peter Heller. Copies have already been ordered for current Book Club members, but anyone interested in participating can request a copy on their personal accounts or inquire at the library's front desk if they would like help in obtaining one.